With our strong desire to be original and our dedication to superior craftsmanship in all we do, we created the Encompass Shower Bases, our own line of custom shower bases. Born out of beautiful design and driven by innovation, Encompass Showers Bases are designed, manufactured and exclusively available at Sander & Sons. With Encompass, you can transform your bath into a unique, shower experience with our one-piece custom shower base complete with a built in high-efficiency linear drain. Designed for elegance and easy entry while providing better water evacuation, Encompass Shower Bases bring you the perfect marriage of form and function. Create a stunning bathroom with a true walk-in shower. With no curb, your custom shower base can become a seamless part of your bathroom, creating an elegant and luxurious feel. And with only a two percent single slope for better balance, all water gently flows to the linear drain. No more annoying water pooling and no more slippage, creating a safer shower experience. No standing water with our flush shower floor and a double slope linear drain that evacuates up to five gallons per minute. From the design of the custom shower base, to the double-sloped linear drain, water has nowhere to hide. It all goes down the drain. No grout lines mean no harmful bacteria and mold, giving you a healthy and clean shower! Plus, the linear drain strainer is easily removed for quick drain cleaning. Our non-porous, solid material also keeps stains away, keeping your custom shower base looking like new. Encompass Shower Bases are available in standard colors of white, cameo, bisque and bone. But, over 200 color options are available, allowing you to create that perfect shower for your unique vision of your bath. The material is solid and the color runs throughout thickness of the base, making it very durable, easy to clean, and long lasting. 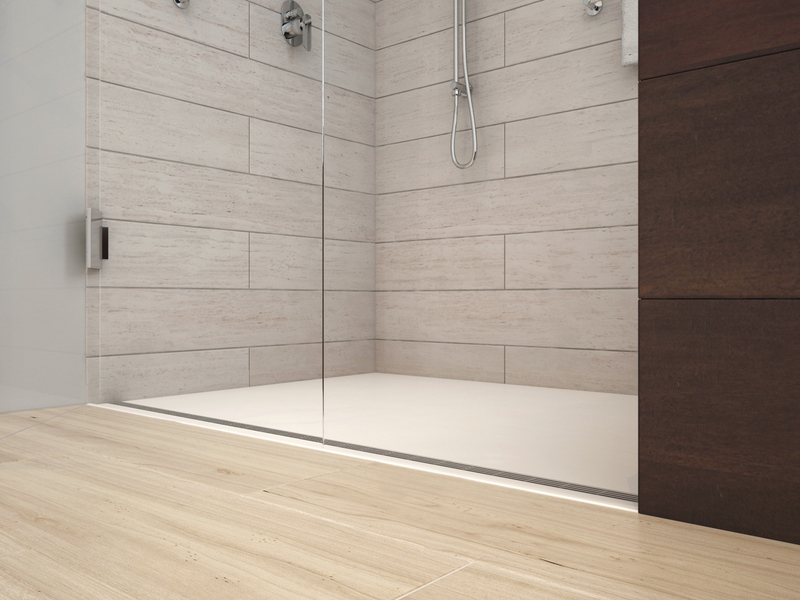 With a variety of standard sizes and custom sizes up to 110″ wide x 60″ deep and the ability to install with any type of wall finish material, Encompass Shower Bases can work in virtually any bathroom. And, Encompass Shower Bases are compatible with most standard drain outlet configurations and can be customized to fit your needs. Create a custom shower of your dreams. Swing by our Denver area full-service kitchen and bath showroom and see our Encompass Shower Bases today. Our team of design specialists will show you all the options and possibilities for your new, custom shower.